Status: offline If it was a gunshot wound, there's no saying that it has to hit the femur square on. Which would likely shatter it, as Greg alludes to. 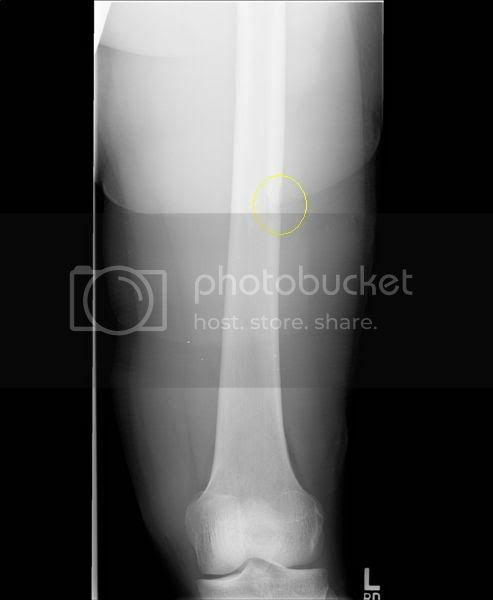 It could easily have just bumped the side of the femur on the way out of the thigh. 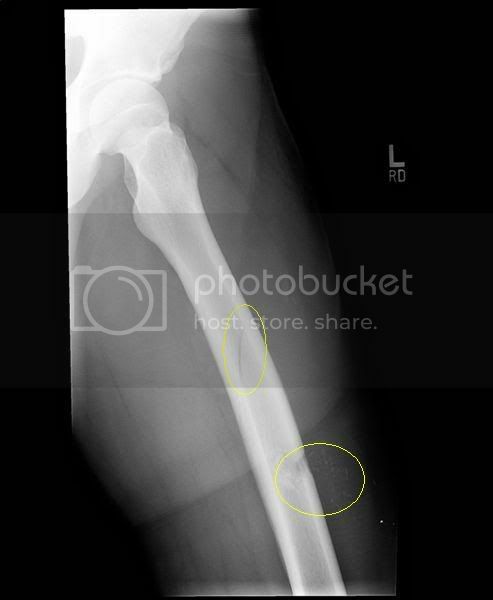 Perhaps those are bone fragments next to the injury? Something doesn't look right for it to be one of those benign lytic lesions, it's too localized and the borders are too well defined. I'll throw my hat in with Chris and vote for a GSW. Status: offline It`s definitely a gunshot wound. Status: offline Are there more pictures to look at? Status: offline It could be a GSW or it could be a fragmentation injury from material such as rocks made into projectiles during an explosion. Status: offline Could be termites. Never know. Status: offline If it isn't a gun shot wound it may be from shrapnel. Status: offline I think a USPS postal truck hit him. Status: offline The broken bone is a figment of your imagination but indeed is a hypomobility at the L3-4 left facet joint. Mobilisation at this level will heal any referred pain or damage to structures. Just joking. 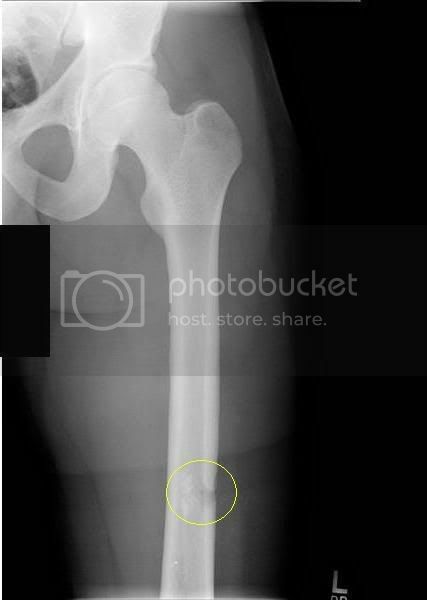 There is a fracture of the mid shaft of the femur and is present secondary to penetrating projectile injury. Vertical extension proximally and distally noted. Periosteal reaction is present around the femoral shaft with some extension of osseous fragments into the anterior thigh soft tissue which may eventually produce heterotopic ossification. Status: offline Good call Chris. Status: offline That was a good case Alex. Keep them coming! Status: offline I'm especially impressed by the poster that caught the periosteal reaction. Once again, you folks are impressive. But I'm sorry, I still think it's termites. Status: offline Termites, L2 facet mobilization, usps postal truck, LOL! Alex, thank you for this case.